Mostly wooded (hardwood canopy), with lots of elevation. Water comes into play a couple of holes but easily navigated. Some holes with wide open pastures provide a nice change of pace. Multiple pin placements and many holes have dual tees. *February 2019 We are pleased to announce that through the efforts of our volunteers the West side is once again a full 18 hole course! There has been a re-numbering of some holes but signage has already been put in place to help guide players and more is coming. The first important change to note is a new hole after hole 24. After exiting hole 24 to the left, players will play a new island hole 25. The tee is across the path and players will throw onto the island. If a tee shot lands out of bounds, the player must throw another tee shot. After establishing a shot in-bounds, regular OB rules apply. 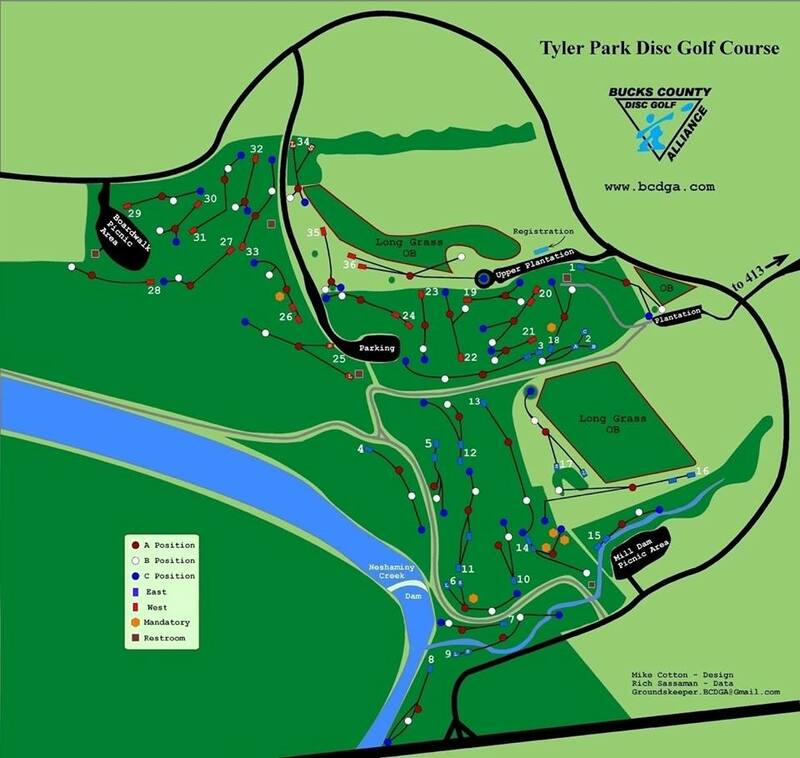 After hole 27 (old 26), players will find signage guiding them to the new hole 28 which is near the boardwalk parking lot. Enjoy these new holes and please consider joining us for some work days to help us add new pin positions and permanent teepads! I-295 W/E Exit 8, take Rte 332 West (Newtown Bypass). At 3.2 miles it becomes Rte. 413 North, 1.7 miles more to park entrance on left. Turn in, follow road to stop sign, go right, then 1st left into parking lot. Course in the woods on the left. Coming along great! Keep up the restoration effort!